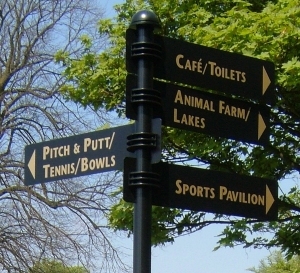 At 248 acres, including the Animal Farm, Graves Park is the largest park in Sheffield, embracing an impressive variety of contrasting features. Vast expanses of open parkland with short grass are bordered and intersected by natural and semi-natural woodlands. 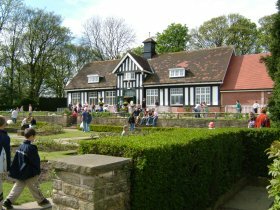 Graves Park is also a multi-sports and recreation site with facilities for tennis, bowls, miniature golf, cycling, and orienteering. In Estate papers of 1887, it was described as 200 acres of 'rich arable pasture park and woodland" with timber, and abounding with oak and other trees, as well 'as sheets of water and extensive pleasure grounds'. The land that constitutes Graves Park was formerly part of the Norton Estate, and the earliest known reference to its ownership is contained in the Last Will and Testament of Wulfic Spott in the year 1002. The reference in the Domesday Book shows that Godiva and Bada held the land at Norton during the reign of Edward the Confessor. Roger de Busli held the land thereafter, followed by someone called Ingelram. His son, Ranulph de Alfreton, and grandson, Robert FitzRanulph, followed the latter. A change of dynasty came in 1269, during the reign of Henry III, when the line of Ingelram failed to produce a son. The female heir, Alicia de Alfreton, married Sir William Chaworth who became the new ruler at Norton. When the line of Chaworths ended in a daughter, Joan, the name disappeared when she married John Ormond. One of their daughters, Joan, married Thomas Denham, the other, Elizabeth, married Sir Anthony Babington. The result was that the estate was split between the Denhams and the Babingtons. The Denhams' share passed by sale, successively, to the Bullocks, the Eyres, and the Blythes. In 1587 the other portion of the estate was also acquired by the Blythes, who sold the estate in its entirety again to a landowner, John Bullock. When the Bullocks fell into difficulties they mortgaged Norton to Cornelius Clarke, who had no children and so passed Norton onto his sister Ursula, who married Stephen Offley. The Norton Estate remained with several generations of Offleys, until the heir, Urith, married Samuel Shore. It was Samuel Shore who rebuilt Norton Hall and is credited as being responsible for greatly extending and opening out the grounds around the house, forming the estate into a landscape of beautiful parkland. The Norton Estate remained with the Shores until 1843, when the then Lord of the Manor, Offley Shore, was forced to dispose of the Estate, owing to the failure of his bank. The next resident at Norton Hall was James Yates who came, not as Lord of the Manor, but as a tenant. The sale by auction of the Shore Estate in 1850, received no bid, but was eventually secured by Charles Cammell. The Cammells were followed by John Sudbury who sold the Estate to W.F. Goodliffe and in turn it was sold to Bernard Alexander Firth in 1902. 1925 saw the most significant change in the ownership of the land. 112 acres (including Norton Hall) were purchased on behalf of the Sheffield Voluntary Hospitals, from Bernard Firth, who at the same time presented some 7 1/2 acres of land as a gift to the hospitals. In the same year 154 acres of the Estate were purchased by Councilor and Mrs. J.G. Graves, and presented to the Corporation as a gift to the City of Sheffield, for use as a public park. 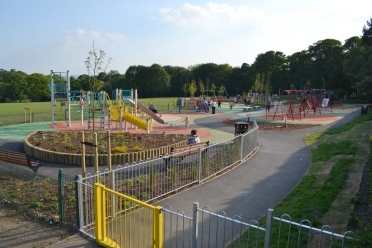 At three times the size of Norfolk Park, this new public ground, which the Corporation named 'Graves Park' was the largest in Sheffield. Its location on the peripheries of Sheffield, yet within the city boundaries and bordered by the hospital site, was considered to be ideal. It would fulfill the dual purpose of providing the people of Sheffield with a fine sports and recreational space, while simultaneously protecting the land surrounding the hospital from pollution or development. The boundary of the new park ran along Hemsworth and Cobnar Roads then down Meadowhead as far as the lodge leading up to the hospital site, to which the park joined beyond Norton Church. The Graves Park gift included Bolehill Farm and Cobnar Cottage, situated near the Cobnar Road boundary, at the northern section of the park. Both features are 'Buildings of Special Architectural or Historic Interest', listed Grade II, and considered important elements within a valuable group of traditional stone buildings. Bolehill Farmhouse was partially damaged by fire in 1978, and was sold in 1982 to Agrocare Ltd. for residential use, at a cost of £17,100 and an annual ground rent of £25. The Graves gift also embraced three woods named Cobnar, Waterfall, and Summerhouse. Complementing the vastness of the recreation areas the woods provide shaded enclosures with man-made paths leading to different portions of the park. 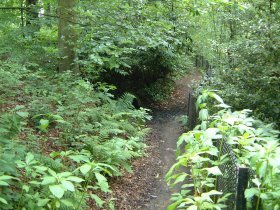 There is a nature trail at the southern end of Graves Park for the visitor to identify particular trees, shrubs, and wildlife. Summerhouse Wood was named after the shooting lodge that used to be occupied by the head forester, but was demolished by fire. Standing on the south side of the wood in 1925 was a picturesque summerhouse, later converted into tearooms. Beech and Sycamore are found at the entrance to Cobnar Wood, and further in are a group of ash saplings, and coniferous trees. 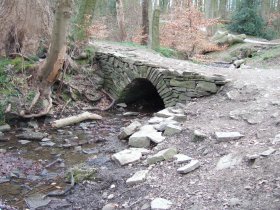 There is a stream running through Cobnar Wood, which flows, from a sand stone outlet, between clay and shale. This shale is apparently, some 300 million years old, formed by compaction of the river sediment, which accumulated during the Upper Carboniferous Period. To the left of the path are some common alders, and grey squirrel and bird life is plentiful. The path forks by a horse chestnut tree and slopes on the right. This leads to another junction of paths. Across the left-hand path is a packhorse bridge, which is constructed with an arch of stones. This is inconclusively dated 14th to 19th century. The right side path climbs upwards revealing more ash and a sweet chestnut. Further on a marshy area is situated between a ditch and a group of bushes. The line of the ditch marks the route of an old packhorse road from Sheffield, via Derbyshire Lane and Little Norton, to Chesterfield. Apparently, this was turnpiked by an Act of 1756, and was a main route to London for stagecoaches and other vehicles until c.1795, when the Meadowhead Road was opened. The path splits two ways again and on the left are a couple of elm with nettles, rushes, and general vegetation. There is another marshy spot some way up the hill, with various plants and mosses, and on the right, are more sycamore, beech, and oak. Ash, alder, and marshy patches are also evident in Waterfall Wood, which of course, has the additional feature of a number of small waterfalls. Deeper into the wood, lime, poplars, horse chestnut, and more ash, are standing. Eventually there is another break with one path leading up to the pavilion, out of the wood. Around this area are oak, holly, and a few beeches, and further on, some birch. Further along still, are two more waterfalls; the first appears to have formed from a mixture of sandstone and shale, and is surrounded by ferns and grasses. The second waterfall, the largest, has a steeper fall over a gorge-like valley. The path then leads out of the wood towards the boating lake. By contrast, there is a spectacular sense of openness and freedom to be had within the extensive playing fields. The panoramic views coupled with the sheer scale of the place make it easy to imagine that one is far from any city. This impression is added to by the stillness of the place. Traffic and the hustle and bustle of the town are inaudible in the central parts of the park. Standing in the middle of the landscape the visitor is enclosed by a network of mature trees, buffering him/her from the rest of Sheffield. This section of the park is perfect for children to run around freely, with little risk of misadventure. The roads are so far away that parents can allow their children more freedom to play, without fear of them running out in front of a car, or charging into other obstacles. The southern portion of the park was separated from the hospital grounds by three lakes, stocked with fish and substantial enough for boating. The larger of the three already had a boat-house in 1925, but this has now been demolished, and today the surface of the boating lake is almost entirely covered with leafy plants, although there are frequently a number of keen fishermen/women at the other two ponds. At this time Graves Park had only two entrances, at Chesterfield Road on the southwest, and at Hemsworth Road, opposite Derbyshire Lane on the north. In 1927, a scheme was approved to convert a quarry in Cobnar Wood, originally the site of the old Norton Rifle Range, into an open-air theatre. Around the natural cavity, at one end of which there was a wall of stone, the ground rose steeply and was covered with trees and bushes. The undergrowth was cleared away and the ground leveled. A platform was erected under the quarry wall with seating arranged to face this stage. During the summer months the Parks Committee arranged a variety of theatrical events, including orchestral and chamber music, bands, and plays. There were also plans to build permanent dressing rooms in the vicinity and a platform-roof for rainy evenings, but it is unclear if these schemes materialized, as contemporary photographs of the theatre show no evidence of them. The location of the open-air theatre is now overgrown. During the early years of the Corporation's ownership, walks were constructed, the lakes cleaned out, and a great deal of planting and general laying-out took place. By 1929 six cricket pitches had been laid out. 43 acres of land, formerly occupied by a tenant farmer were obtained by the Corporation. This formed a significant addition to the recreation space of the park. In the same year a new approach road to the park from Little Norton Lane, to the top of Charles Ashmore Road, was completed. In the following year, football and hockey pitches were laid out, as well as yet more cricket pitches. Also in 1930, a new entrance was constructed in Charles Ashmore Road, with wrought-iron gates and stone pillars. In 1931, J.G. Graves purchased another 8 acres of the estate and presented it to the city. This land, near to the junction between Chesterfield Road and Cobnar Road, had been retained by Bernard Firth at the original sale in 1925. By securing this portion of the estate, the Corporation was later able to provide an additional entrance, allowing access from Chesterfield Road. A children's playground was also erected on this site and seems to be very popular with the local community today. Its position allows infants and parents to easily access the playground without the necessity to trek miles through the park. Two years later, another entrance at Cobnar Road was built and shrubs and flowerbeds planted beside it. In the same year, two weirs were constructed with rustic bridges, and three of the nine turf tennis courts were converted into hard courts. By the following year three more had been converted. Also in 1934, an Old Men's Shelter was built near the Cobnar Road entrance, and a drinking fountain installed, although its’ exact location is unclear. Graves Park was extended by between 43 and 44 acres in 1935, another gift from J.G. Graves, who purchased the land from the trustees of the four Voluntary Sheffield Hospitals, for £13,000. The hospital trust sold an additional 48 acres to developers, retaining 28 acres (including Norton Hall) for its own purposes. This extension, therefore, reached from the southern limit of Graves Park (pre 1935) to the Serpentine Walk. An original feature from the thirties that survives today, is the formal rose garden. Located in front of the refreshment pavilion, this is a sunken garden with steps leading down to it. It was designed and laid out in 1938 by E.O. Sadler (who had been responsible for Beauchief Garden, two years before). The garden is arranged in a geometrical pattern, with rectangular paving separating sections of roses of the hardiest variety. Originally 1000 rose trees were planted, along with hedges and violas of contrasting colours. The paving was taken from slum clearance houses, and the low bordering wall and steps were made from rock from local moors. Wooden seating is arranged around the outer path of the garden, and there is a stone pergola with timber beams at one end and a sundial at the other. Both the pergola and the sundial remain today, although there is an instrument missing from the top of the sundial. The stone base is still standing, with part of a decorative bronze surface inscribed, 'When time is not, only shall I pass away'. In the centre of the rose garden there used to be a statue of Peter Pan, but this has been removed entirely. There is a small fenced in play area with a sandpit situated to the front of the rose garden, which seems to act as a resting place in the centre of the park, after children have tired themselves out with the other attractions. Upgrading and improvements have continued to be made to the park. A second bowling green was laid out between 1959-60. A new sports pavilion'-was opened in 1961, a gift from the Graves Charitable Trust, and in the same year, further landscaping with rhododendrons and azaleas. A new lodge for the Head Park Keeper was built at the Charles Ashmore entrance in 1964, and the boundary wall on the Hemsworth Road was replaced with a wrought-iron railing set on a dwarf stone wall in 1966. By this time all the tennis courts in Graves Park had been reconstructed. There were now four all-weather courts, two loose surface courts, and one tennis-quick (porous concrete) court. With the aid of a grant from the Department of Education and Science, Norton Woodseats Cricket Club was able to provide a new pavilion in Graves Park in 1968. Around the same time, parking spaces for thirty cars were provided at the Charles Ashmore entrance. In 1976, the Recreation Program Committee acquired 22 acres of agricultural land adjoining Norton Hall. The Committee developed the idea of introducing an animal centre into Graves Park, and a year later were presented with a Highland heifer and a Belted Galloway heifer by the City of Manchester. These two animals became the foundation stock of the animal unit, which now contains rare breeds of sheep, pigs, and cattle. The Rare Breeds Centre occupies an area to the east of the park, best accessed from the Hemsworth Road entrance. The primary aim of the animal park is to preserve the rare genetic material, which these animals represent. 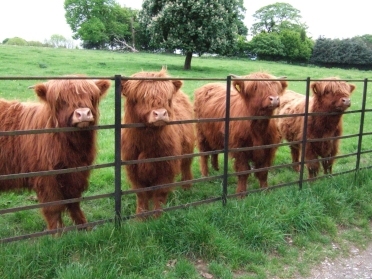 All the young animals are bred in Graves Park, and the purebred and pedigree records of the Highland cattle are kept under the herd name of 'Escafeld'. The other breeds, "Chantrey Ponies", donkeys, and goats are also kept for their appeal to children, rather than for their rareness. Norton Hall Nurseries (a gift from J.G. Graves) used to be the old kitchen garden of the Lord of the Manor. It was here that H.D.Widdowson developed the 'Chantreyland Viola'. In 1988 the integration of Graves Park, the Rare Breeds Centre, and Norton Nursery created Chantreyland, Sheffield’s first theme park. Sir Francis Leggott Chantrey was born locally in 1781 and is buried in Norton Churchyard. During his lifetime he became one of Britain's most prolific sculptors, yet despite his success he maintained close ties with his birthplace. The area around Norton is now known as Chantreyland as a mark of affection for the local celebrity. In 1989 the Henry Moore Foundation, the Arts Department, and the Recreation Department sponsored a unique arts project. Twelve artists created works in 90 days, the results of which produced Sheffield's Sculpture Trail. The permanent sculpture's in Graves Park include, 'Welcome' by Pete Marshall (situated near the pavilion), the 'Green Man' by Rod. L Powell (in Waterfall Wood), the 'Poggy' seat by Wendy Marshall (in Cobnar Wood), and two seats by Vega Barmejo (near the boating lake). Unfortunately the ravages of time have done sever damage to these artworks. During the early 1990s Chantry Cottage, which was part of J.G.Graves 1935 gift, was sold by the City Council on a 125 year lease, even though this was against the agreed covenants. Since this time there have been boundary and planning disputes concerning this grade 2 listed building. Then in 1998 the City Council attempted to sell off the 7 acres of land occupied by Norton Hall Nurseries. 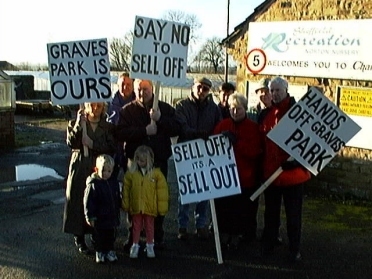 A local outcry led to the formation of a pressure group called the 'Hands off Graves Park Committee'. This group successfully prevented the sale of the land, which is now being returned to parkland. 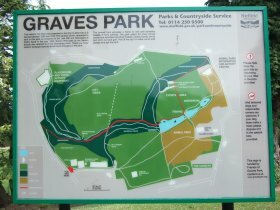 The group are now known as 'The Friends of Graves Park', and are a registered charity with a veto over developments within the whole of the park’s area. Today, Graves Park continues to provide a temporary escape from city-life, and its size and varied character ensure a new adventure on each visit, which makes it especially appealing to children. 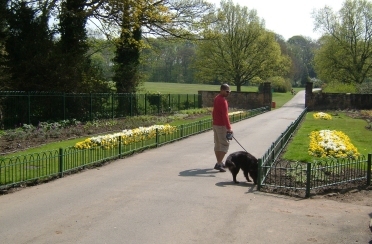 Graves Park is also an excellent example of the important role of benefactors in the development of Britain’s public parks. Finally, it illustrates the significance of public spaces as a deliberate attempt to halt urban expansion. Recent activity on the Nurseries site suggests that the rubbish is being cleared. This does not solve the problem because the next lot of rubbish will be arriving shortly when it is collected from the parks across the city. Clearly this activity gives a sombre message to the residents of Sheffield; this is what your Council thinks of Graves Park and this is how the gift of J. G. Graves to the people of Sheffield is being abused and mistreated by the Council and its representatives.